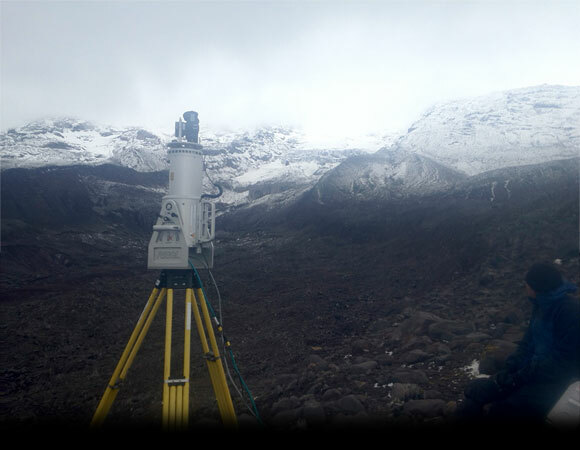 As part of ongoing research that seeks to understand the implications of glacier retreat at Volcán Chimborazo, Ecuador, researchers from Ohio State University are attempting to quantify both the rate and extent of glacier retreat on the mountain in recent years. If successful, we will better understand the vulnerability of potential water resources of surrounding communities During the course of this investigation, it has been determined that 10-15% of the mountain's remaining glaciers are comprised of debris-covered ice which cannot be monitored using traditional satellite-based remote sensing techniques. Mass balance measurements (the difference between growth and melting) of debris-covered ice remain a particular glaciological challenge, and very little is known about the response of debris-covered ice to changing climatic conditions in tropical environments. Jeff La Frenierre and Bryan Mark seek to monitor the rate of change on a particularly large, low-elevation section of debris-covered ice in order to compare the behavior of this feature to other, non-debris-covered sections of glacier over a single year. Results from this study will aid in understanding rapidly changing glaciers in alpine environments. Changes to Alpine glaciers impact local populations, causing disruption of fresh water resources and hazards from glacial lake outburst flooding. In other regions of the world, such as the Himalaya Range, large intra-glacial lakes have the potential to destroy entire villages from outburst flooding events. By studying the changes of alpine glaciers, these local populations may be able to mitigate potential hazards. 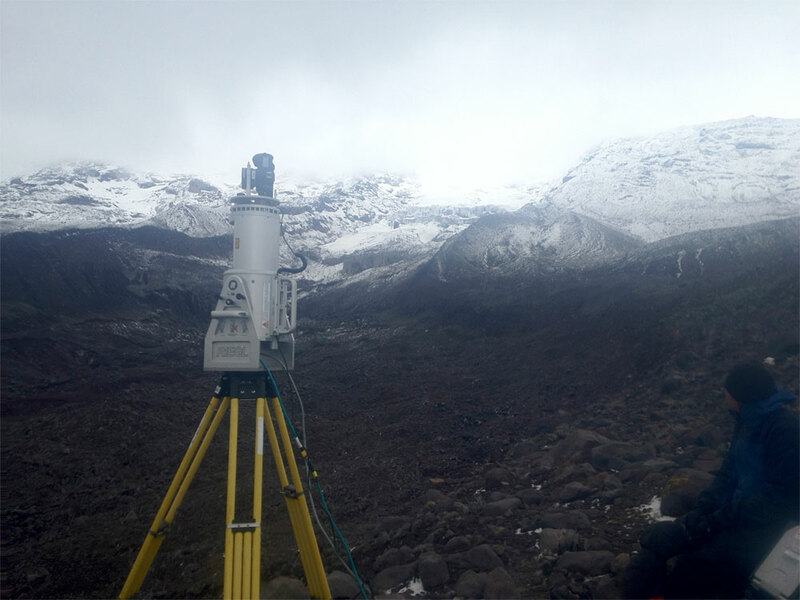 The field work conducted on Chimborazo volcano provides a test case for future alpine glacier change research with Terrestrial Laser Scan (TLS) technology. Figure 4. Sometimes even the best mule guide gives little incentive for horses to follow. Photo by Ollie Wigmore. 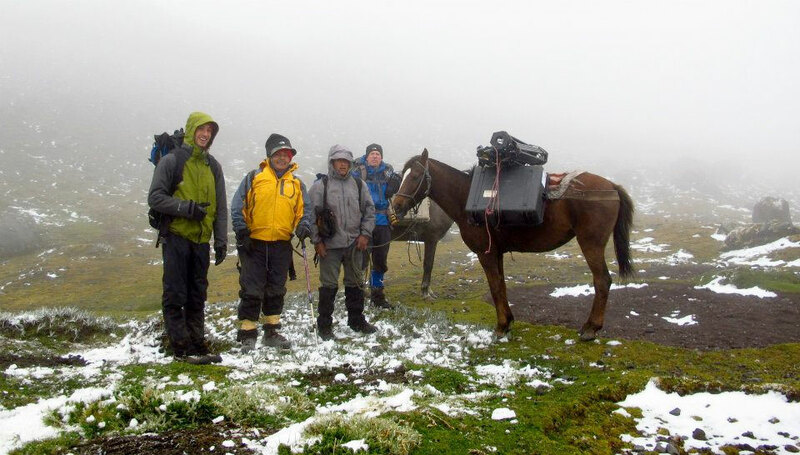 The field work on Chimborazo presented various challenges. 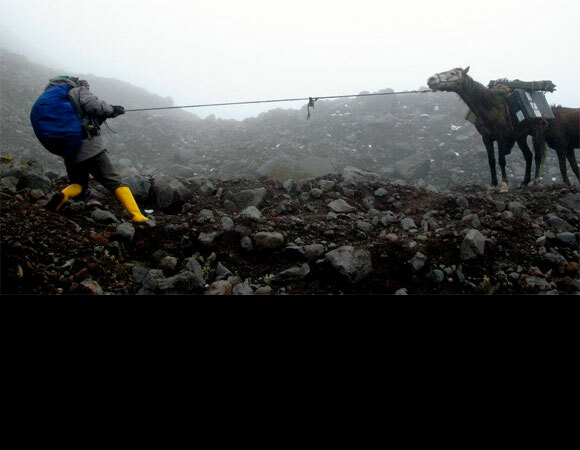 Transporting the equipment from the city of Riobamba was difficult when rain soaked roads became slick and muddy. 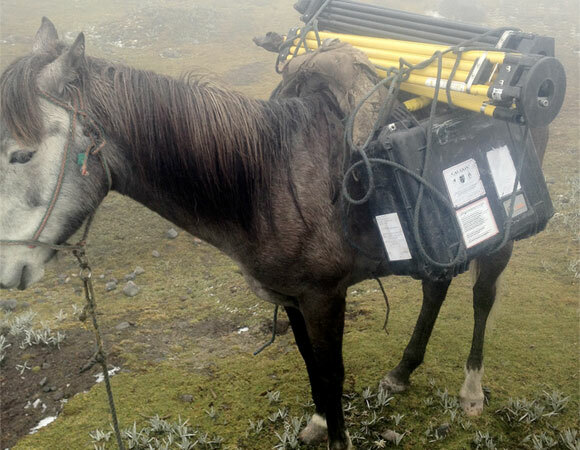 Once on the mountain, horses were required to move equipment and supplies to and from the base camp and study area. 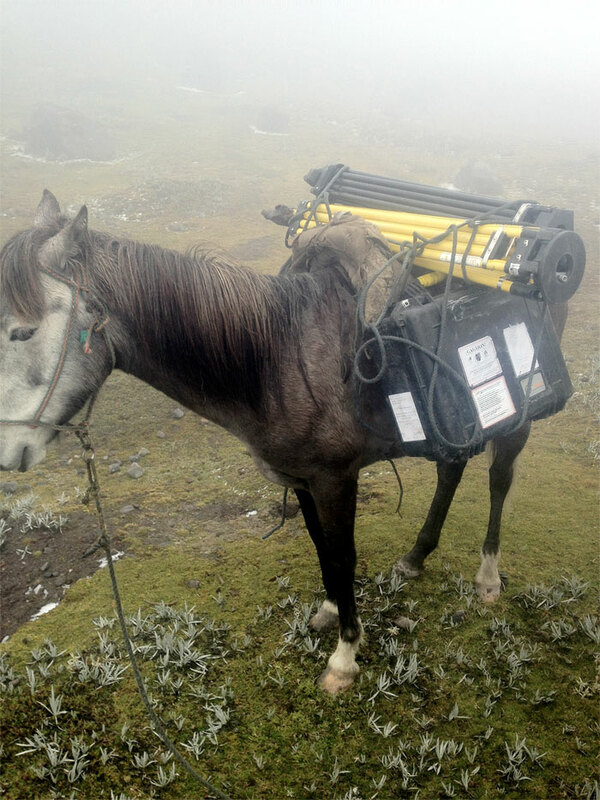 The horses were not always willing or able to move equipment. 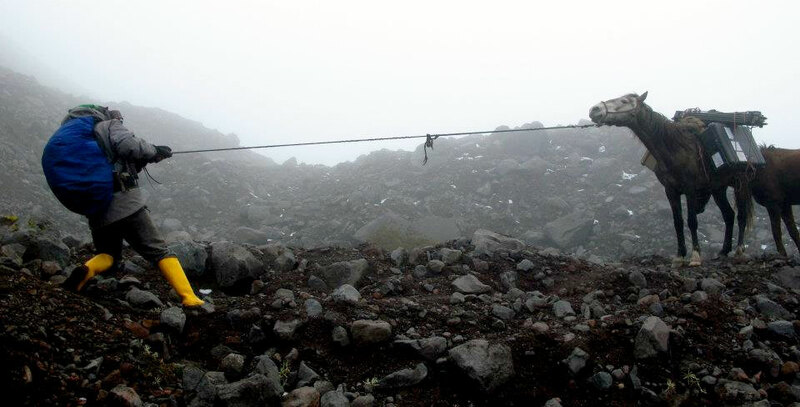 Working at high elevations of up to 15,000 feet above sea level presented specific hazards to field members, including difficulty breathing, headache, altitude sickness and fatigue. 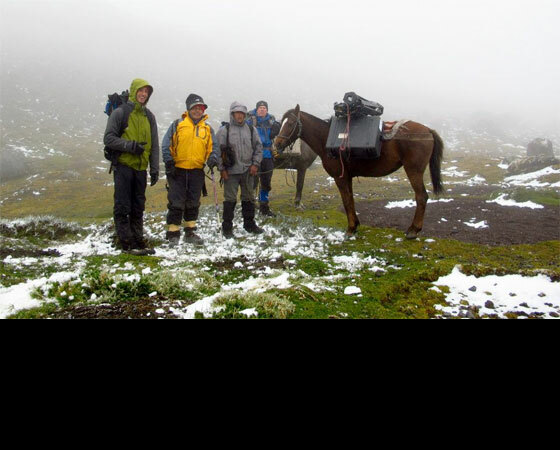 Weather patterns at any time of year in the high Andean mountain ranges are unpredictable and can prohibit data collection. Importation of the LiDAR scanning equipment required extensive cooperation with the US Embassy for customs clearance and shipping logistics. Future work will include a repeat scan of the study area to produce a map of surface change and volume loss/gain of the debris-covered glacier.